Yes, it may look like two yellow foam tennis balls in a tube, but the My Keepon from Wow! Stuff is a captivating little dancing robot that will rock out to the music that you play. Via a very small microphone located in the robot's nose, the Keepon can pick up the music you jam out to or whatever tapping, clapping, stomping sound you make. It's pretty sensitive to noise and can understand the rhythm of the music, so the robot can move in time with the music. It doesn't matter what genre of music that you listen to, the robot can keep up - and won't make any comments either!. Whether you listen to slow songs or heavy rock, Scissor Sisters or Frank Sinatra, Meatloaf or My Chemical Romance, your music won't be too much for this cute little chap to handle. The performances the robot gives will always be one of a kind - no copycat presentations here! With a variety of sensors strategically placed under the skin, the Keepon will respond to actions such as tapping it with your finger or giving it a gentle squeeze. It will react to your touch by turning to look in the direction of the touch. The minute the My Keepon from Wow! Stuff starts its day, it wants to interact and lets you know this by acting in ways to get itself noticed. The toy likes to communicate in ways that are non-verbal, using robotic squeaks, sounds and chirps, and it's really cute to watch the robot shake its head back and forth. 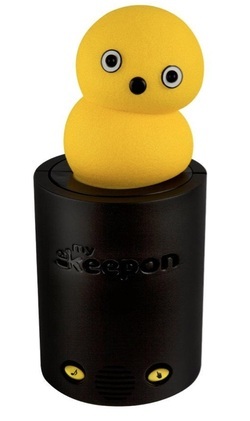 The yellow part of the Keepon is pliable and soft, and about the size of two stacked up yellow tennis balls in height.The stage that the Keepon sits on is strong and quite sturdy, which makes it the perfect container to keep the mechanism (or brains of the toy) protected in. What's really cool about this interactive and fun Christmas toy is its ability to go all moody just like a human can. One minute the toy is excited and thrilled, the next, it is wondering what's going on, and eventially shows signs of being sleepy! The My Keepon from Wow! Stuff uses batteries or a power adapter. If you do use batteries, you'll have roughly enough power from them for the little guy to rock out to about 100 songs, depending on song length. Of course, if you prefer not to get batteries, then the robot can play longer using the power adapter.